A Latvian policeman leads a group of Jews to the execution site on the beach near Liepaja. A group of Jewish women and children undress prior to their execution by Latvian collaborators on the beach near Liepaja. Members of the 21st Latvian Police Battalion assemble a group of Jewish women for execution on a beach near Liepaja. A group of Jewish children is led to an execution site on a beach near Liepaja. A Latvian policeman leads a group of Jewish women to the execution site on the beach near Liepaja. A group of Jewish women stand at the edge of an open mass grave facing the sea, where they await execution by a firing squad of Latvian SD and police. A group of naked Jewish women and girls walk to the execution site on the beach near Liepaja. In the background other Jews are being forced to undress by Latvian police. Jews are forced to undress prior to their execution by Latvian police on the beach near Liepaja. A Latvian policeman walks along the edge of a mass grave towards the bodies Jewish women and children who have just been executed. A group of Jewish women who have been brought to a beach near Liepaja, stand at the edge of an open mass grave facing the sea, where they await execution by a firing squad of Latvian SD and police. A Yugoslav war crimes investigator (Professor Sh. Premer) examines exhumed bodies in the Uskoci Forest. A Yugoslav war crimes investigator (named Rodic) examines exhumed bodies in the Uskoci Forest. Dr. Alexander Libo standing beside a mass grave at the Ponary mass extermination site near Vilnius (Vilna). Photographed on February 2, 1958. A mass grave at the Ponary mass extermination site near Vilnius (Vilna). Corpses exhumed from a mass grave at the Ponary mass extermination site near Vilnius (Vilna). The bodies of Jews from the Zolochev (Zloczow) ghetto, in a mass grave. This was located beside the village of Jelichowice, some four km east of Zloczow. Photographed in 1942. The bodies of Jews from the Zolochev (Zloczow) ghetto, exhumed from a mass grave after the liberation. A man and woman viewing the body of a child from the Zolochev (Zloczow) ghetto, which was exhumed from a mass grave after the liberation. People viewing the corpses of Jews in a mass grave that was discovered in Iwje. Gravediggerers lowering bodies into a mass grave in Lancut. A mass grave of Lenin Jewry (in the Polesye region, on the Russo - Polish border). Jewish gravediggers are standing in and on the upper edge of the grave. Note: The Jewish community of Lenin was killed on the first day of the Hebrew month (Rosh Hodesh) of Elul, in August 1942. Jewish gravediggers in a mass grave in the Belzec cemetery. In the grave are some ten bodies wrapped in shrouds. People standing by the site of a mass grave of the Jews of Dubno. The coffins of thirty - five Jews in a mass grave in Nowe Miasto. This photograph was apparently taken after the war. Soldiers of the Red Army beside a mass grave of the Jews of Wysock. The city was liberated in January 1944. The location of a mass grave in Chepilovo where the Jews of Slonim were murdered and buried. Photographed in 1959. The location of a mass grave in Chepilovo where the Jews of Slonim were murdered and buried. A Soviet investigating committee excavating a mass grave of the Jews of Kozin. Photographed in 1944. A Soviet investigating committee beside a mass grave of the Jews of Kozin, which they excavated. Photographed in 1944. Two men and two women beside a mass grave of the Jews of Kurenets. A mass grave of the Jews of Svencionis (Svencionys) and the surrounding area. Some eight thousand Jews were killed here between September 27 and October 9, 1941. The remains of Jewish victims from Utena (Utian), Lithuania, being exhumed from a mass grave after the liberation. A mass grave of Jews in a forest in Lithuania. Photographed in 1941. Residents of Lithuania beside the bones of Jews found in a mass grave at Utena (Utian), Lithania. Photographed in 1964. A mass grave in which 3,000 Jews were shot in Pajust, near Panevezys in Lithuania. Photographed after the liberation. Corpses lying atop a mass grave in Siauliai, Lithuania. 215 Jews were murdered here. The bones of Jews uncovered in a mass grave at Utena (Utian), Lithuania. A mass grave in a cemetery in Nove Zamky, Czechoslovakia. 19 Jews were buried there. A German soldier shooting a Jew from Vinnitsa, Ukraine, at the edge of a mass grave. German soldiers are watching him from behind. The photograph was found on the body of a German soldier and he had written on the back: "The last Jew in Vinnitsa". Photographed in 1943. Two uniformed men beside a vast mass grave containing the bodies of Jews murdered in Vinnitsa, Ukraine. German soldiers shooting Jews who are still alive in a mass grave in Vinnitsa, USSR. Photographed in 1943. German soldiers among the bodies in the mass grave in Vinnitsa, Ukraine. Two uniformed men standing beside or on a mass grave in Mineralni Vodi, Caucasus. Three hundred Jews were interred in the grave. German Gestapo men shooting Soviet POWs at the edge of a mass grave. German soldiers are watching them from behind. Photographed in September 1943. The execution of civilians at the edge of a mass grave in the USSR. Those being killed are standing beside an earthen rampart and below them is a mass grave filled with many bodies. Civilians beside a mass grave of Jews in Zhmerinka, Ukraine. Beside them are the remains of some bodies that were exhumed from the grave. The exhumation of Jews' bodies from the mass grave in Zhmerinka, Ukraine. A German soldier with a pistol, shooting at bodies in a mass grave in the USSR. The corpses of Jews in a mass grave that was discovered in Iwje. The Jews were murdered on May 1, 1942 and the exhumation took place on July 15, 1944. A mass grave in Drobitski Yar near Kharkov. Fifteen thousand Kharkov Jews were murdered here in March 1942. A mass grave in Kragujevac, Serbia, containing bodies of Jewish men. Photographed on May 21, 1941. The opening of a mass grave in the city of Bialystok. The opening of a mass grave in the city of Bialystok. Photographed in 1946. A mass grave containing the bodies of Janowska camp inmates. A mass grave on the grounds of the Skarzysko - Kamienna camp. Members of the Soviet investigating committee in the Klooga camp beside a mass grave there. Photographed in 1944. Victims in a mass grave. Corpses in a mass grave. Bodies that were removed from temporary mass graves being reburied in a mass grave. Bodies of Jews removed from a mass grave in order to be decently buried. Bones and skulls that were exposed in a mass grave. Civilians beside an exposed mass grave. Rows of bodies, possibly exposed in a mass grave. A row of corpses in a mass grave, after exhumation. A row of bodies that were removed from a mass grave. Bodies in a mass grave. Jews in the Ukraine digging a mass grave for themselves. The bodies of women killed by the German army, in a mass grave in Kerch. Bodies taken from a mass grave in Taganrog, Russia. These were Russian civilians killed by the Germans. Jews who returned to the town of Iwje, beside a mass grave discovered there. The grave contained the bodies of 2600 Jews who had been killed there. Photographed on April 20, 1945. The area where Jews of the town of Lazdijai were killed and buried in a mass grave. In this place, the Katkiskis estate, Jews from Lazdijai were killed in November 1941. Photographed in 1998. Jewish Holocaust survivors beside a mass grave where Jews from Gorodok are buried. The Jewish cemetery in Radomsko in 1975. The gravestone in the photo was put on a mass grave of murdered Radomsko Jews. The upright square stones mark the boundaries of the grave. A mass execution of Jews in Nazi occupied Soviet Union. Naked Jews, including a young boy, just before their murder. Jewish women from the Mizocz Ghetto in the Ukraine, which held roughly 1,700 Jews. Some are holding infants as they are forced to wait in a line before their execution by Germans and Ukrainian collaborators. 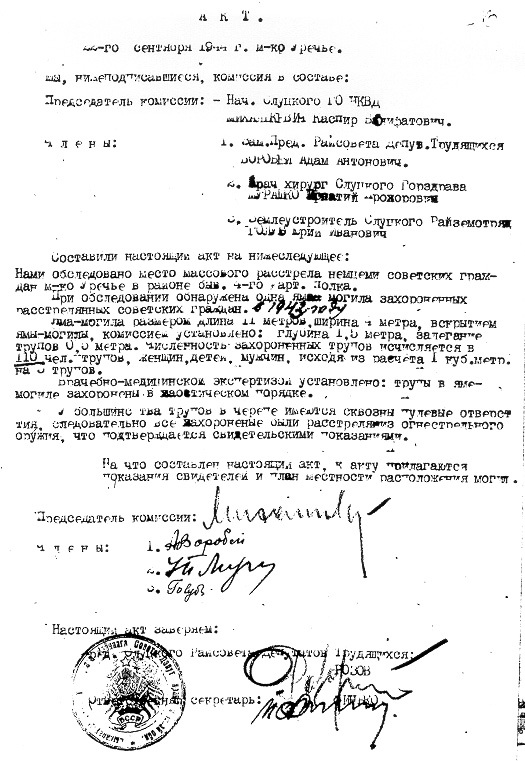 Document by the local NKVD committee about the discovery of one of three mass grave sites where the citizens of Urechye were buried. 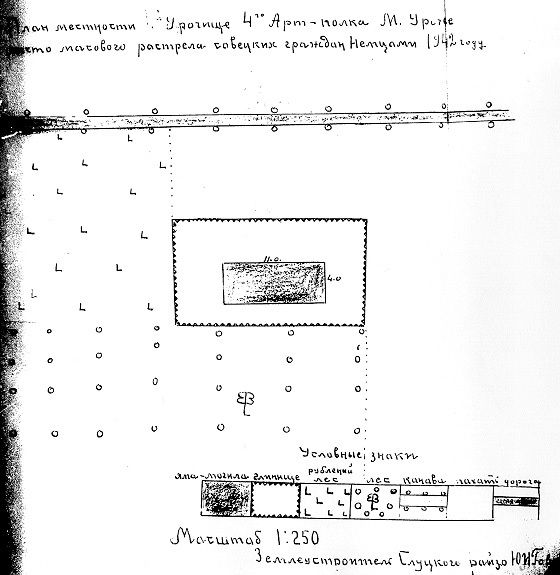 Schematic map drawn to show the site of the same mass grave in Urechye. List of the Holocaust victims in Urechye. max wrote: Evidence from the Estonian State Archives of the Former Estonian KGB (State Security Committee) records relating to war crime investigations and trials in Estonia, 1940-1987. - Military procurator's statement on examination of mass grave site in company of accused Kullamaa, May 23, 1956. - Sketch of execution site near town of Paide. - Statement on exhumation of remains, May 23, 1956. - Forensic report on mass killings in the Riga area, December 12, 1944. - Photos of killings, bodies, mass graves. Let me add an excerpt from the report of a Soviet investigation commission in Zhitomir, 5 to 16.02.1944. Source: West German criminal trial procedure Js 4/65 GstA Frankfurt/Main, Russian files, Volume 1, quoted in Klee/Dressen, "Gott mit uns": Der deutsche Vernichtungskrieg in Osten 1939-1945, pages 31 and following. What follows is my translation of the German text, which is a translation of the Russian original. 1) 500 meters to the south of the factory [German: “Vorwerk”] Dovshik, which is located in the forest 10 kilometres away from the city of Zhitomir, two shooting sites and places of burial for corpses were found. At first two places were found along the way that leads to the N.-Volynsk street at kilometre 9 from the Dovshik factory. Six graves were found, from which 962 human corpses of both sexes and various ages were exhumed. Then on the way leading from this factory to the street at kilometre 8 an area of two hectares was found which was fenced in by wire three meters high among which thick oak branches had been woven which couldn’t be looked through from the outside. On this area 13 graves were found, with the measurements 16 x 2 x 2.5 meters. When the graves were opened a male corpse, the rests of a corpse partially eaten by fire and a huge number of human bones were found. During the exhumation a strong smell of corpses was noticeable. The witnesses present at the exhumation stated that at the location sighted civilian citizens had been shot and also buried in the course of the years 1941/42. In July 1943 this site had been fenced in, and guards had also been posted. Eyewitnesses had observed that during one month smoke had gone up from the fenced-in place, which had had an extremely foul smell and spread in such a way that it could still be sensed in the houses of the Dovshik factory, 500 – 600 meters away from the place. The commission of forensic medical experts reached the conclusion that on the mentioned area burials and later exhumations and burning of human corpses, not less than 20,000 in number, had taken place. The Soviet Commission's investigation cited before suggest that this was by no means the only massacre committed by German forces in the area of Zhitomir. Within the scope of S.K. 4 a the extensive preparations required within the scope of the general collection of the Jews of Kharkov were carried out at an accelerated pace. The priority was to find an appropriate area for the evacuation of the Jews in close co-ordination with the quarters service of the city. ZStdLJV, 4 AR-Z-269/60, collection of documents, pages 164-169, quote pages 164 and following. HHStAW, 631 a, 1856, pages 223-227, quote page 225 and following. [...] It was in the middle of December 1941, when I spent several weeks in Kharkov. I still know exactly today that it was on 15.12.41 when I saw in Kharkov how a trek several kilometers long of Jews in long rows with handcars and luggage moved from the city eastwards to the tractor factory. The tractor factory is about 15 km away from the city center. Among the Jews there were men, women and children. Some cars were drawn by small horses who sometimes broke down under their load. On the cars there were sometimes little children, women and sick people sitting on the luggage. The cold was about 15 degrees (celsius) below zero. I watched the Jews passing by for a full hour and still the trek didn’t end. I estimate the number of Jews who on this day were led from Kharkov to the tractor factory at ca. 15 000 persons. I still recall that the trek was secluded and guarded by uniformed men. I cannot tell anymore today, however, whether these were members of the SS or Ukrainian auxiliary police in uniform. I didn’t observe any mistreatment of the Jews during this. When on the next day I drove in my car from Kharkov to Tshugev, I used the same road that the trek of Jews had used on the previous day. On the left and right side of the street I repeatedly saw corpses that were from the trek of the Jews. Whether these Jews had die from mistreatment or shooting or from exhaustion I cannot tell. The corpses lay there abandoned and nobody cared about them. [...] With a truck and several passenger cars in which the commanders drove we went out of the city in the direction of the tractor factory. About 5-10 km after the tractor factory we stopped in an open area. Close to the execution site there was an anti-aircraft gun emplacement. The Jews were already at the place. There were members of our detachment present who were guarding the Jews. The shooting of the Jews was carried out in a ravine. It was a crevice which went up to the middle of a larger hill. I was ordered to the execution detachment. The execution detachment with a strength of 10 men entered the crevice that went about 20 meter inside the mountain. The Jews were led inside in groups of 20-25 people and had to lay down on the ground. The were shot in the neck with machine pistols. The shooting didn’t last long, approximately 1 ½ hours. The whole procedure lasted longer because we were constantly fired at by Russian planes. Due to this fire a number of these Jews were already killed. A member of the detachment was also wounded by the fire. The detachment which had to do the shooting was not relieved during the execution. The rising walls were then blown up onto the corpses. had nothing to do with this technical procedure .The Ukrainians were standing round trembling. The children were taken down from the tractor. They were lined up along the top of the grave and shot so they fell into it. The Ukrainians did not aim at any particular part of the body.They fell into the grave.The wailing was undescribable.I shall never forget the scene throughout my life.I find it very hard to bear.I particularly remember a small fair-haired girl who took me by the hand.She was shot later..
10 remaining territories, including the territory Minsk-Land, which is already free from Jews. The danger that the partisans will, in future, derive any important support from the Jews will then have ceased to exist. I myself and the SD would certainly much prefer that the Jewish population in the district general of White Ruthenia should be eliminated once and for all when the economic requirements of the Wehrmacht have fallen off. For the time being, the necessary requirements of the Wehrmacht who is the main employer of the Jewish population are still being considered. The clear anti-Jewish attitude of the SD and the difficult task of the units in White Ruthenia to deliver again and again new Jewish transports from the Reich to their destination, both put an undue strain on the physical and spiritual strength of men of the SD and diverts them from their real purpose, which lies in the White Ruthenian region itself. Last edited by Roberto on 20 Feb 2003 20:31, edited 2 times in total. Roberto -- Thanks for an excellent and highly informative series of posts! in the area of Urechie in the former place of stationing of the 4th artillery regimen. The pit-grave measurements :Length -11 meters ; breadth 4 meters . per 6 ( ?.. smeared ) corpses. Majority of the corpses have bullet-made holes therefore t all were killed from some firearms which corroborates with the eyewitness testimonies. Again the translation is clumsy and really verbatim. Thanks for the translation, Michael. I wish I could read Russian (I'll start learning it next month). This means it was a different massgrave from the ones mentioned by Gerlach, described by a commission of the city of Minsk on 13.08.1944. While those graves contained mainly prisoners of war, this one obviously contained the bodies of executed civilians. Everytime I read something like this I keep asking myself : how was this possible? Could I be also doing this if I was them? Has Germany been blessed with the share fact that they still exist despite all that they have done? I just can not reconicile inside me that something like this is possible and really happened and find all the accusation for the behavior of Soviet army in Germany ridiculous. All the best to you. Excerpt from Christian Gerlach, Kalkulierte Morde, pages 770 and following. […]Die offiziöse Zahl der Opfer, die in und um Trostinez ermordet und verscharrt wurden, beträgt 206 500. Solche Ziffern – unmittelbar nach dem Krieg wurden sogar 546 000 Opfer angegeben – sind nach der vorliegenden Untersuchung bei weitem zu hoch. Zu rekonstruieren scheinen etwa 40 000 Opfer sowie zusätzlich eine unbekannte Zahl von Gefängnis- und Lagerhäftlingen aus dem Raum Minsk, die bei Razzien und Unternehmen der Partisanenbekämpfung festgenommen worden waren. Genaue Angaben sind unmöglich, da die Massengräber ab Oktober 1943 vom deutschen Sonderkommando 1005 exhumiert und die Leichen verbrannt wurden. Die Aussagen der daran beteiligten weisen ebenfalls auf etwa 40 000 bis 50 000 Tote in den dortigen Massengräbern hin. Die Berichte der Untersuchungsbehörden von 1944 gaben etwa 150 000 oder bis zu 150 000 Opfer, griffen aber wohl auch zu hoch. Insgesamt – das ist eine grobe Schätzung – könnten 60,000 Menschen bei Trostinez vernichtet worden sein. […]The officious number of victims who were murdered and buried in and around Trostinets is 206,500. Such figures – immediately after the war even as many as 546 000 victims were indicated – are far too high according to the present study. It is possible to reconstruct about 40 000 victims and additionally an unknown number of prison – and camp inmates from the Minsk area who were apprehended during raids and anti-partisan operations. Exact data are impossible to provide because from October 1943 onward the mass graves were exhumed by the German Special Detachment 1005 and the corpses were burned. The depositions of those participating therein also point to about 40 000 to 50 000 dead in these mass graves. The investigation authorities’ reports of 1944 indicated about 150,000 or up to 150,000 victims, but they were obviously also on the high side. In total – this is a rough estimate – 60,000 people may have been destroyed at Trostinets. Subject of the proceeding: Shootings, gassings in 'gas vans', as well as burning alive of thousands of Soviet and West European Jews, who had been deported to Minsk, of Gypsies, mentally disabled, other Soviet civilians and Soviet agents, during the years1941-1944, within the jurisdictional territory of the KdS/BdS Minsk. Reprisal shootings: among them, execution of 300 men, women and children from Minsk, after the attempt on the life of Generalkommissar Kube. David Thompson wrote: Roberto -- Thanks for an excellent and highly informative series of posts! I'm glad you appeciate it, David. A document, or collection of documents, that is repeatedly mentioned in connection with mass graves in the surroundings of Minsk is “The Evidence Collected at Minsk“, Nuremberg Document USSR-38. Do you have a translation of this in your Nuremberg collection? If so, could you provide a scan thereof ? About ninety kids were murdered at Belaja Tzerkov . some house ( for about day and a half AFAIK without water and food ) after their parents were executed by the Blobel Zonderkommando. The chaplains conveyed what they saw in this house to the one of the men of 295th Infantry Division general staff Lietenant Colonel Groscurth. and got the answer upon his request from the Oberscharfurher SS Hafner ( I think it was Hafner ) that the children "were also to be eliminated ". He could not believe this and ordered the field commander of his unit to guard the area around the house and informed (of what he had found out from the SS officer) the division headquarters and from there was directed to contact the Six Army headquarters. The Six Army headquarters ordered to postpone the execution but then after interferring of Blobel himself it was decided that the execution has to be carried out . Roberto -- I did appreciate those cites. I thought they were an excellent contribution, and the fact that they were all gathered in one place makes for easy reference, as well. It is an excellent curative for the less well-read contributor, who might otherwise bring little more than an extreme, noisy and belligerent ignorance to these discussions. Unfortunately, the Nazi Conspiracy and Aggression set I've been scanning only has the Anglo-American Nuernberg exhibits, and not the Soviet or French ones. Those exhibits exist on microfilm (US National Archives and Records Administration, Record Group 238, Prosecution Exhibits Submitted to the International Military Tribunal. Microfilm PublicationT988. 54 rolls, with Roll list available), but none of my local university or public libraries has a set. I'll keep pestering the librarians to acquire the rolls, and if I can get access to them I'll copy and scan them for the forum. David Thompson wrote: Roberto -- I did appreciate those cites. I thought they were an excellent contribution, and the fact that they were all gathered in one place makes for easy reference, as well. It is an excellent curative for the less well-read contributor, who might otherwise bring little more than an extreme, noisy and belligerent ignorance to these discussions. I suspect Harry Mazal of THHP has them and would be happy to supply them if asked. I'm not familiar with the THHP (at least by its initials; please pardon my ignorance). I'd love to get these primary source documents scanned and posted. If you've got some suggestions about how to do this, step right up (on the forum or by private mail).